When time-critical logistics business Menzies Distribution was looking to reduce its logistics costs and improve internal supply chain processes, it turned to Goplasticpallets.com who provided a long lasting plastic pallet solution, as well as invaluable product advice. Best known for its newstrade distribution, Menzies has been serving customers in the UK print media sector since 1833. Every day the company is responsible for delivering seven million+ newspapers from its 50 depots across the UK and Ireland to more than 25,000 retailers, travelling some 135,000 miles in total. Menzies receives press products in bulk from its publishing customers which are picked and packed into plastic tote boxes at its main packing hubs in Aylesford, Wakefield and Paisley. Previously the company was using wooden pallets to move the press products internally; however when Menzies introduced automated palletisers they started to experience problems with inconsistency – since wood swells when wet – and stacking. Having sourced samples from several plastic pallet suppliers, Menzies’ project management team visited Goplasticpallets.com at a trade show in Birmingham where its sales experts impressed Menzies with a product demonstration and their industry knowledge. In fact, by talking through their requirements, Goplasticpallets.com helped Menzies solve several supply chain issues, which in turn generated substantial savings for the company – which went down very well! The solution Goplasticpallets.com recommended was its APB 1210 Pool Perforated 5R pallet – a heavy duty, full perimeter design which in addition to its competitive price offered the benefit of saving space in storage – crucial for busy packing environments. The pallets were quickly integrated into Menzies’ internal supply chain. On arrival at the packing hubs the press products are packed into plastic tote boxes which are automatically stacked onto the plastic pallets by a robot. The full pallets are then loaded onto Menzies’ transhipment vehicles and sent to its 36 distribution sites across the UK. Here the plastic pallets are then unloaded and returned on the next available vehicle to the hub. 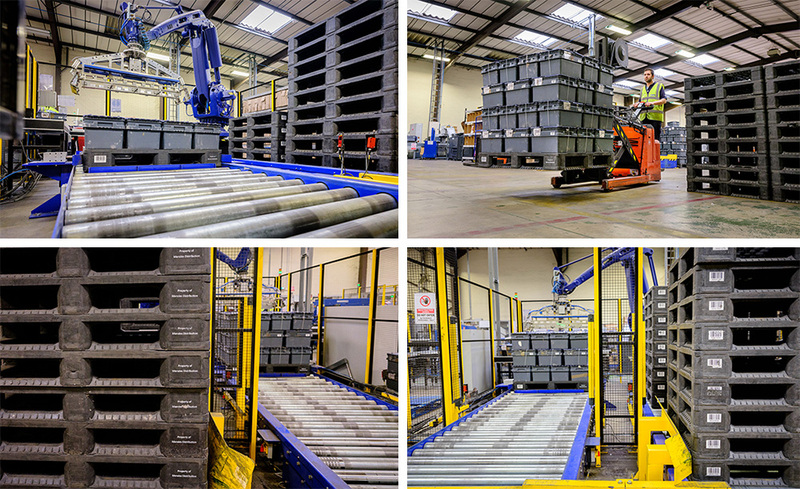 Goplasticpallets.com delivered 4,680 APB 1210 Pool Perforated 5R pallets which were all screen printed with ‘Property of Menzies Distribution’ on-site at the company’s impressive warehouse in Eastbourne, East Sussex. Although the plastic pallets aren’t currently being used externally, Menzies wanted to future-proof the pallets should they consider using them outside their internal supply chain. Andrew Poskitt, Project Manager – Strategic Development at Menzies Distribution, said: “The plastic pallets work seamlessly with our totes – we’ve not had any issues with them. There is also a lot less mess, as there’s no wood chip in and around the operation. As the plastic pallets have a long life span, we hope to be still using them in five, maybe even 10 years’ time.